“Where to next, Captain?” Axel asked as the Maverick flew through warp space. “I don’t suppose your friends have given any word on Dane Lory,” Persephone said. “I’m afraid not,” Cyrus told the mysterious red-haired woman. Cyrus wasn’t quite sure what to do next. With their business on Pyraxia concluded, the Maverick crew were a bit limited in their options on where to travel to until they dealt with the mercenary band known as Maelstrom. However, until Jun Azarov gave the word that the organization’s leader had returned to their base, the crew needed needed to hold off on their attack. “I guess I’ll be traveling with you all for a while yet,” Persephone said after a moment. “No complaints here,” Axel said, flashing a grin. Cyrus couldn’t help but chuckle. Axel had certainly become quite smitten with Persephone in the short time he had known her. “Is there anywhere we can look for a quick and easy job?” Gaster asked, jumping into the conversation. “All this space and not a job board in sight,” Taraka said as he walked through the open atrium of the spaceport on Rixius where the Maverick was docked with Ace and Gaster. The atrium was a large open space where many merchants had set up shop. For a location that was known as a trading post in this region of space, the lack of a job board was surprising to the monk, as most other similar spaceports he had visited since the beginning of his pilgrimage had one somewhere. That did not appear to be the case here on Rixius. “They’re really not as common as you might think,” Gaster said. “I don’t imagine there’s much work for travelers like us on a mining colony world like this,” the former smuggler continued, gazing out one of the atrium’s large windows onto the frozen plains outside. Rixius was a cold world covered in tundras and frozen forests as well a few oceans that weren’t frozen only because they were salt water. The planet’s chilly climate didn’t make it appealing to live on, but due to the wealth of valuable ores beneath its surface, it was home to many mining colonies. On virtue of being the only mildly civilized planet in this region of space, it had become a bit of a trading post, which is why the Maverick’s crew had chosen it as their refueling stop. They had been hoping to find a job here, but at the moment they weren’t having much luck. “At best, perhaps we can see if the local authorities have any bounties posted or something like that,” Gaster continued, turning back to his crewmates. “I agree,” Taraka said, nodding. “Alright, let’s have a look,” Gaster said. With that, the trio set out to find whatever local authorities existed in this particular spaceport. It turned out that the local authorities on Rixius were the security forces for the mining corporation that ran the planet’s mines and financed its colonies. “Hello there,” Taraka said as he and his crewmates stepped into the security office in the spaceport. “What can I do for ya?” one of the security officers asked, approaching them. A smile appeared on Taraka’s face. “I love when Pokemon are the problem,” the monk said. He liked dealing with situations like this, as they meant he got the chance to add some new Pokemon to his team while also helping people out. “How typical of a corporate mining world,” Gaster commented. “Then why do you need someone else to do it for you?” Gaster asked. “Look, do you want a job or not?” the officer asked in return. “Sounds good to me,” Gaster said. Gaster shivered as he stepped out of the shuttle onto the landing pad outside the mine he and his crewmates had been flown to. The security officer at the spaceport had been right; Rixius was too cold for bandits. It was too cold for anyone, really. Eager to get out of the cold, Gaster walked swiftly across the landing pad to the mine entrance, Ace and Taraka close behind. As the trio approached the entrance, they were greeted by a couple of security officers. “You the guys they sent to help with our situation?” one of them asked. The officer nodded and ushered them inside. It was still quite cool, but it was certainly an improvement from outside. “So what’s the problem here, exactly?” Taraka asked the officer as he led them through the tunnel to another door. “The drill bored down into a cave with this underground lake in it and now we’ve been having trouble with the local wildlife there,” the man explained. “What type of Pokemon are there down there?” Gaster asked. “Right this way,” the security officer said, opening the door they were standing in front of. Stepping through, Gaster found that they were now in some kind of break room area where the rock walls of the mine had been reinforced and insulated, making it quite warm inside. A few miners and security officers were sitting around at the tables that had been set up sipping on coffee or having a bite to eat. Gaster nodded. “Got it,” he said, taking a step toward the elevator. With Ace and Taraka in tow, the former smuggler crossed the room and boarded the elevator. Gaster gripped his rifle tightly as the elevator slowed to a halt. He wasn’t quite sure what would be waiting on the other side of the doors, so he wasn’t taking any chances. Fortunately, there didn’t appear to be any immediate dangers when the doors slid open. The former smuggler took a step out and gazed around the large open cavern he found himself in. The area near the elevator was well lit, revealing abandoned mining equipment and partially mined out sections of the cave walls. On the edge of the lit area was a pristine lake that stretched out into the distance. The smooth, mirror-like surface of the water reflected the man-made lights, casting a faint shimmering glow on the roof of the cavern. “Quite beautiful,” Taraka said as he walked up behind Gaster. “I suppose,” Gaster replied. “But let’s not let our guard down.” He then reached for a Pokeball and sent out his Shuppet. “Indeed,” the monk agreed. He nodded and sent out a Pokemon of his own, specifically his Zebstrika. Cautiously, Gaster approached the water’s edge with Ace and Taraka right behind him. Scanning the area with his rifle, Gaster noticed an Amaura eyeing them curiously from behind a rock. “There’s one,” the former smuggler said, pointing the Pokemon out to his crewmates. “That’s something I’d like to add to my team,” Taraka said as soon as he laid eyes upon the cute Pokemon. Before he could finish his sentence, Gaster was cut off by a loud Pokemon cry that sounded from the lake. Gaster turned his head to where the sound originated from and spotted a Dewgong in the water, and it looked quite agitated. As if on cue, the Dewgong let loose a blast of freezing air at Taraka and his Zebstrika, who just happened to be closest to the shore. Luckily both the monk and his Pokemon reacted quickly and were able to avoid the incoming attack. “Blitz, use Shock Wave!” Taraka commanded his Zebstrika in response before putting up a psionic barrier. His Pokemon fired off a jolt of electricity at the Dewgong as it continued to swim to shore and, while it seemed to have some effect, it only served to make the Pokemon even more agitated. Reaching the shore, the Dewgong let loose another blast of icy air, this time hitting Blitz dead on. The Zebstrika let out a whine as a thin layer of ice encased her legs. “I’ll keep your Pokemon safe!” Ace shouted. The android activated his shield, then moved in front of Taraka’s Zebstrika, putting himself between her and the Dewgong. Gaster raised his rifle to shoot the Dewgong, but then he suddenly heard two loud thuds behind him. He turned his head to see a Graveler and a Roggenrola behind. “More of them!” Gaster called out to his crewmates. “Must have dropped from the ceiling.” He quickly pivoted and aimed his rifle at the Graveler. “Clara, use Will-o-Wisp!” he then commanded his Shuppet before squeezing the trigger. As the Graveler was struck by a barrage of laser fire, Gaster’s ghostly Pokemon sent an equally ghostly flame its way, burning through its rocky hide. Gaster continued firing off shots at the Graveler until he saw the Roggenrola moving up on him out of the corner of his eye. He barely had time to duck as several large rocks flew over his head at high speed. That was too close, the former smuggler thought as he ran for cover behind a large stalagmite. As he peeked around his cover to line up another shot, Gaster witnessed the Graveler jump into the air and land in the middle of his crewmates and their Pokemon. The rocky Pokemon sent out a seismic shockwave as it landed, but, fortunately, no one was hurt. Ace moved to keep the Graveler off Blitz’s back while Taraka ordered her attack again. “Blitz, Shock Wave that Dewgong again!” the monk commanded. The Zebstrika fired off another bolt of electricity at the Dewgong, which paid in kind by firing back a sharp and pointy shard of ice. “Dodge it!” Taraka called out. His Pokemon swiftly maneuvered out of the way, and the icy projectile instead shattered against a nearby stalagmite. Turning back to the two rock Pokemon, Gaster watched Ace throw a Pokeball at the Graveler, successfully capturing it. That just left the Roggenrola on their flank. “Clara, use Knock Off!” Gaster commanded his Shuppet as he lined up a shot. As the Shuppet moved in, the Roggenrola fired off a salvo of sharp spears of ice, which pierced through her ghostly form in five different places. “Fall back, Clara!” Gaster called out. “Hit it with Will-o-Wisp!” His Shuppet sent a ghostly flame towards the Roggenrola, then began to retreat. Ignoring the flame burning through its rocky exterior, the Roggenrola launched a rock at Clara as she retreated, taking her out. “Damn!” Gaster cursed before firing off his rifle, landing several shots on the Roggenrola. As it stumbled back, Gaster recalled his fainted Pokemon and sent out his Cinccino. “Lulabelle, use Encore!” he commanded the newly sent out Pokemon. The Cinccino did her thing, sending the Roggenrola into a confused daze. As the Pokemon stumbled around, Gaster pulled out a Pokeball and threw it as hard as he could. The ball found its mark, and instantly captured the Roggenrola. With the Roggenrola out of the picture, Gaster turned around to see how the others were doing. 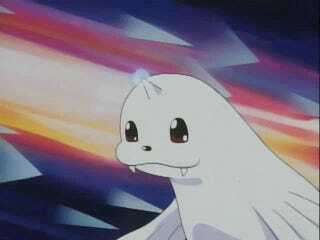 He watched Taraka’s Zebstrika zap the Dewgong with more electricity, only to have more shard of ice flung back at her. Then, Taraka ran to the water’s edge and threw one of his homemade Pokeballs. It made contact and pulled the Pokemon inside. It shook several times, sending ripples across the surface of the lake, then fell still. “That takes care of that,” Taraka said. The monk then recalled his injured Zebstrika and sent out his Tangrowth before reaching into the water to collect the ball he had thrown. Just as he was getting back up, a Goldeen suddenly appeared from beneath the lake’s surface and attempted to spear him with its horn. “Roma, deal with it!” Taraka commanded his Tangrowth. “Vine Whip!” Reaching out with one of her vine arms, Roma swatted at the Goldeen, then grabbed it and threw it ashore. “Fresh fish here if you want it!” Taraka called out to his crewmates. “I’ll take it,” Ace replied. He then pulled out a Pokeball and threw it at the fish Pokemon flopping around hopelessly on the ground. The ball shook only once before falling still. “Now, where we,” Taraka said, turning to the Amaura, which was still looking on from behind a rock. “I’ve got you,” Gaster said before turning to his Cinccino. “Lulabelle, use Thunder Wave.” Sparks flying off her fur, the Cinccino fired off an immobilizing jolt of electricity at the Amaura. Suddenly finding itself under attack, the Amaura attempted to flee. It ran only a few feet before the electricity caused it to seize up and collapse on the ground. “Now, Tail Slap!” Lulabelle then ran in and slapped it several times with her tail, getting some good hits in while it couldn’t defend itself. “Get it, Roma!” Taraka ordered his Tangrowth. She sent out one of her vine arms and gave the Amaura a good whack before ensnaring it. The Amaura fired back a cold beam of energy as last ditch effort before Taraka threw a ball and captured it. It did some significant damage to the Tangrowth, but she would easily be able to regenerate herself now that the threats had been neutralized. “The ‘big one’ that man upstairs mentioned, perhaps,” Taraka suggested. Gaster opened his mouth the speak, but a sudden loud splash stopped him short. Rising up from the depths of the crystal clear depths, a large serpentine form broke the surface of the water. It was simultaneously breathtaking and frightening. Towering above his crewmates and their Pokemon, Gaster took in the magnificent sight of the largest Milotic he had ever seen. It was no ordinary Milotic either; this one’s long hair-like fins were a cool shade of blue, and its the end of its tail was decorated with beautiful golden scales. As Gaster prepared to order his Cinccino to attack, the Milotic suddenly opened its mouth and released a freezing blast of snow and ice at Ace and Roma, who just so happened to be closest to it. Ace raised his shield to protect himself, while Taraka’s psionic barrier kept the monk’s Tangrowth relatively safe from harm. Recognizing the threat the Milotic posed, Gaster moved back and aimed his rifle. He squeezed the trigger, firing off a slavo of shots at the serpentine Pokemon, drawing its attention away from the Tangrowth, who would be their best chance at dealing with it. “Roma, use Giga Drain!” Taraka then commanded Roma. The Tangrowth extended out her vine arms and began draining away the Milotic’s energy, revitalizing herself as much as possible. She also recaptured the serpent’s attention. Turning from Gaster back to Roma, the Milotic spewed out a blast of freezing air, but, thankfully, Roma’s vines kept it restrained and prevented it from lining up the shot. “Now, fall back!” Taraka called out. Roma released the Milotic from her grasp and retreated from the edge of the water and as far from danger as she could get. Now free, the Milotic dove down below the surface, only to resurface with a healing veil of water around itself. “We’re going to need some more firepower,” Ace said, assessing the situation. The android grabbed one of his Pokeballs and sent out a Gallade. “Blade, Psycho Cut!” With a slash of his arm, the android’s Gallade let loose a slicing wave of psychic energy, leaving a visible laceration on the Milotic’s scales. “Lulabelle, use Thunder Wave!” Gaster followed up with a command of his own. His Cinccino ran up to the water’s edge and fired off a jolt of electricity at the Milotic. Sparks flying as the electrical current flowed through the veil of water surrounding it, the serpentine Pokemon let out a pained cry before diving back down into the water. It reemerged a moment later, cleansed of the immobilizing electricity. Damn, Gaster thought. “Looks like we need a different strategy,” Taraka said. The monk than moved up beside his Tangrowth and sent out a psionic flame at the Milotic. Unfortunately, the Milotic deftly maneuvered its long body around the flame. It then spewed out another blast of ice and snow from its mouth at the monk and his Pokemon. “You alright? !” Gaster called out. “I’ll hang in there!” Taraka shouted back. “Fall back if you can! I’ll keep you covered!” Gaster shouted as he aimed down his rifle’s sights to line up a shot. He fired off a single shot, and hit right on the mark, eliciting another pained cry from the Milotic. In response, the Milotic coiled itself up tightly to better protect itself. Taking advantage of the opportunity Gaster had given him, Taraka backed away from the water while the Milotic was distracted. “Roma, use Mega Drain!” the monk commanded his Pokemon once he had retreated to safety. As the Milotic’s energy was drained away by the Tangrowth, it unleashed its frosty breath once more. The chilling attack would have been devastating at such close range if not for Taraka’s protective psionic barrier. Nonetheless, Roma was not in great shape. “Lulabelle, use Encore!” Gaster then commanded his Cinccino. As his Pokemon did her thing, disorienting the Milotic for the moment, the former smuggler let loose with his rifle, landing a few glancing shots. As Gaster was far out of the Milotic’s range, the serpentine Pokemon focused in on Lulabelle instead, blasting her with a powerful jet of water that sent her flying backwards. 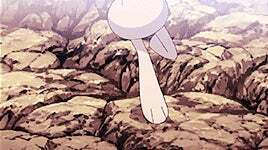 “Roma, use Giga Drain again!” Taraka called out to his Tangrowth as Gaster’s Cinccino got back on her feet. “Keep healing yourself!” The giant viney Pokemon began draining the Milotic’s energy again, draw its ire once more. The serpent slithered up onto the lake shore and blasted Roma with water at point-blank range. It then quickly turned to look at Lulabelle as she ran back into the fray. The Milotic blasted the Cinccino with water, knocking her off her feet once again. “Lulabelle, use Swift, then get out of there!” Gaster shouted. Heading her trainer’s command, the Cinccino fired off a flurry of energy stars at the Milotic, then scamped back to the former smuggler. Once she was within range, Gaster recalled her to her Pokeball, then sent out his Gloom. There wasn’t much more Lulabelle could do at this point without putting herself in significant danger. Meanwhile, Ace moved up in front of everyone so he could serve as buffer between them and the Milotic. “Blade, Swords Dance, then strike with Psycho Cut!” the android then commanded his Gallade. Striking his blades together, Blade began storing up energy, which he then unleashed in a powerful psychic slash. The Milotic let out an anguished wail as the attack sliced right through its scaly exterior, then it turned to the Gallade and fired a powerful jet of water from its mouth. “Blade, Teleport!” Ace called out. Just before the water made contact, Blade blinked away, and it instead hit the ground, spraying rocks everywhere. The Milotic then retreated back into the water and dove beneath the surface once more. Moments later it arose again, looking somewhat refreshed. “What’s it gonna take to stop this thing?” Gaster grunted. No matter how hard they continued to hit this powerful serpent, it didn’t seem to show any sign of weakening. It was no wonder the local security officers had needed help clearing out the mines. Gaster watched as the Milotic sprayed its frosty breath on Roma again. It was so chillingly cold that a layer of ice actually began to build up on the psionic barrier Taraka was protecting her with. The Tangrowth continued to drain energy from the Milotic as it let out another blast of its freezing breath. Despite slowly regenerating her health and being protected by a barrier, Roma was really starting to look worn down by this point. Gaster wasn’t sure how much longer the Tangrowth would stay standing. “It’s time to try something drastic,” Taraka said. The monk then reached down and grabbed a sharp rock off the ground. “What the hell are you doing? !” Gaster shouted as he watched Taraka put the sharp end of the rock against his wrist. As the rock cut through the skin and drew blood, a dark energy began to swirl around the Milotic, which cried out in pain. “What did you just do?” Gaster asked the monk, a look of shock on his face. “Alright,” Gaster agreed. There would be time to ask questions later. “Ficus, you’re up!” the former smuggler said, turning to his Gloom. “Use Stun Spore!” His Pokemon moved up to the water’s edge and blasted out a cloud of immobilizing spores. Seeing this attack coming at it, the Milotic sprayed out a jet of water through the cloud, dispersing the spores before hitting Ficus and launching her backwards. “Damn,” Gaster grunted. Failing to incapacitate the serpent was a setback, but, fortunately, the dark energy surrounding it seemed to be continually sapping away its strength. Might as well try for it, Gaster thought, pulling out a great ball. He ran up to the shore, then threw the ball with all his might. It struck true, and pulled the Milotic inside, then fell down into the water. It shook once … twice … then it broke open! “Gotta weaken it more first,” Taraka said. “Roma, use Mega Drain.” Once more draining away the Milotic’s energy, Roma was repaid with another blast of frosty breath, this one breaking through the last of Taraka’s protective barrier. The Milotic then turned to Gaster’s Pokemon, blasting the Gloom with a jet of water. Ficus was still in good shape, though, and ready to do her job. “Sleep Powder!” Gaster commanded the gloom. Ficus let out another cloud of spores, this time finding her mark. As the sleep-inducing powder landed all over the Milotic’s body, it began flailing around violently, spraying its icy breath all over the place. With this last act, the remnant of the serpent’s rapidly depleting energy was expended. As it began to succumb to sleep and sink into the water, Gaster made a last-ditch attempt to capture it, throwing another ball with all his strength. The ball made contact, pulling the Milotic inside. It then fell into the water and shook once, sending a ripple across the surface of the lake. Gaster crossed his fingers as the ball shook a second time. Seconds passed, but they felt like hours, then the ball shook a third time before falling still. The Pokemon was caught! With the Milotic captured, an air of calm settled over the lake and permeated throughout the cavern. Gaster let out a sigh of relief before fishing his Pokeball out of the water. For some reason, he felt as if capturing the Milotic had somehow calmed the wild Pokemon of the lake, but he wasn’t quite sure why. That was the least of his worries. He still had no idea what Taraka had done. Notes: Alternate Title: The Pokemon Hunting Adventures of Gaster and Taraka, Part 4. This chapter covers all of Session 28 where half the party was absent and it was just Novi and unknown again. It was easy to just say that Dane Lory wasn’t back at base yet so they had some free time after Pyraxia. As usual, they opted to look for work and Pokemon on a randomly generated planet. I got tundra and taiga for the biomes and water for the type, then came up with the idea for a mine when they were asking about problems with local Pokemon. They got a good roll in the mine, so I came up with the idea to use a special shiny ice-shifted Milotic I had used in a past campaign I GMed. I threw a bunch of random generated stuff at them first to throw them off, however. The Milotic actually fainted from its status conditions at the end of the fight, but in a rare act of GM mercy I gave unknown one last chance to try to capture it as his turn was right after it fainted. I felt like it was a shame to waste such a cool Pokemon. After the fiasco with the Sceptile the last time the two of them went Pokemon hunting, they decided they needed an NPC helper. I gave them a choice between Cyrus and Ace and they picked Ace because he was more defensive and could provide damage reduction. It was nice to give him a slightly larger appearance than usual and remind readers that he still exists. As Ace didn’t yet have a full team, I had him try to capture the Pokemon the others didn’t want. This also marked the first time Taraka used the move Curse granted by his Hex Maniac class. The class requires you to use it as a ghost type, which means losing HP. That has certain implications in this universe, those being that you need to injure yourself to use it. I did warn Novi, but he felt like the danger level was high enough to warrant using it. The next time this came up I asked Novi to come up with a narrative reason why Taraka knew how to do this thing that is weird and not really known to even monks, and he said he read it in a book. I rolled with that and expanded upon that, but I’ll leave the details for Taraka to explain to Gaster in the next chapter. Post-Chapter Challenge: This was a fun little chapter with a neat encounter. It was fun to come up with a unique wild Pokemon boss encounter and give it a special lair for it. Now, I wanna see what you guys come up with. My challenge for you is to create your own wild Pokemon boss encounter. Select any non-legendary Pokemon you want, come up with some special traits for it such as being shiny or type shifted or being larger than normal if you want, come up with a lair/arena for it, and, most importantly, give it a little narrative background about it like I did for the Milotic in this chapter, or the Tyranitar a few chapters ago. Have fun! 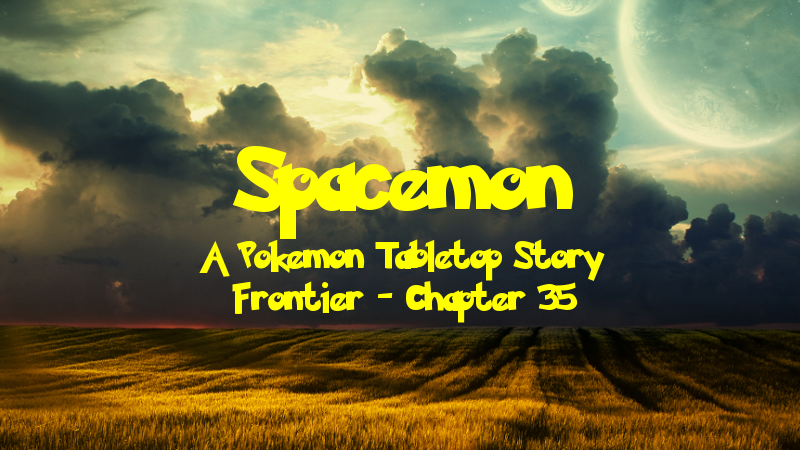 Spacemon: Frontier - Chapter 34: Perils of Pyraxia!